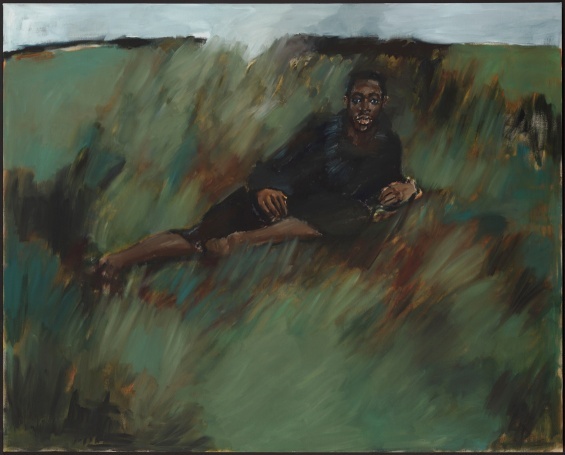 Educators will learn about British artist Lynette Yiadom-Boakye, a 2013 Turner Prize finalist and one of the most renowned painters of her generation. Yiadom-Boakye’s lush oil paintings embrace many of the conventions of historical European portraiture, but expand on that tradition by engaging fictional subjects who often serve as protagonists of the artist’s short stories as well. These imagined figures are almost always black, an attribute Yiadom-Boakye sees as both political and autobiographical, given her own West African heritage. Often immersed in indistinct, monochrome settings, her elegant characters come to life through the artist’s bold brushwork, appearing both formal and nonchalant, quotidian and otherworldly. New Museum educators will facilitate a participatory tour of “Lynette Yiadom-Boakye: Under-Song For A Cipher,” in which we will consider a range of possible narratives, memories, and interpretations provoked by the painter’s fictional subjects’ idle, private moments. Rather than attempt to decipher these works, participants will consider how the paintings elude common discussions of portraiture connected to authenticity and representation based on “capturing” a subject’s likeness, expressing an essence, or a singular idea. We will consider Yiadom-Boakye’s choice to retain opacity and indistinctness as not only an artistic strategy, but also possibly a political one. Participants will consider that Lynette Yiadom-Boakye does not work from live models, but creates imagined subjects through her memory of images from a variety of sources. Making use of found image and ephemeral gestures, educators will participate in drawing activities designed to interrupt students’ learned expectation that “good” drawing is necessarily realistic or has a clear message, which often curtails the desire to draw freely. For questions or to RSVP, contact schoolandteen@newmuseum.org or 212.219.1222 ×231.